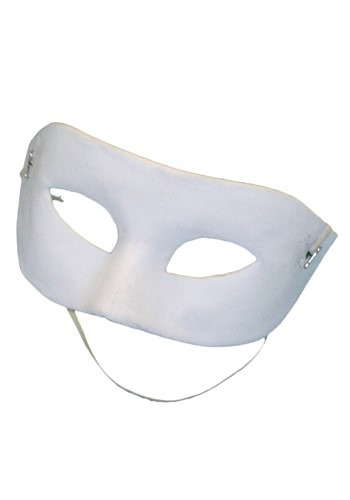 Have a big masquerade ball coming up and need something subtle to preserve your anonymity? Are you Zorro and need something appropriate to wear for opposite day? Are you planning the heist of a century but hate the way that pantyhose feels when it’s stretched over your head? Don’t we all! Well, have no fear, because HalloweenCostumes.com is always here for you with just the right accessory. The Blank White Eye Mask is just the thing you need for going incognito in style. This plastic mask will obscure the most recognizable part of your beautiful, perfect face without covering your eyes, the body parts that scientists all agree are most important for vision. Slip this on courtesy of its supple elastic band and go out and do whatever you want without fear of being judged or arrested (and subsequently being judged by an actual judge -- judges are the last people in the world you want judging you). Disclaimer: HalloweenCostumes.com does not condone committing any crimes unless you absolutely have to or doing so will be really, really fun.